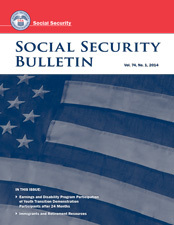 This article presents earnings and Social Security Administration (SSA) disability program payment outcomes for youths participating in SSA's Youth Transition Demonstration project. Participants were randomly assigned to treatment or control groups at each of six project sites. The author provides overviews of the project sites and compares treatment- and control-group youths' earnings 1 year and 2 years after random assignment, and disability program payment receipt 24 months after random assignment.